I think people have a basic idea of what Sufism is; for this piece, it’s enough to know that it is a more mystical movement within Islam, historically centered around particular mystical paths led by one mystical teacher or another, whose teachings would be passed on to successive generations over time. Some of these teachers, as well as other important religious and scholarly figures, came to be venerated by Muslims almost in the way that some branches of Christianity revere saints. It is primarily the shrines to these figures that are under attack. I think we know less about their attackers, and that’s what I wanted to focus on. What does “Salafi” mean? The word derives from the traditional name for the earliest followers of Muhammad, al-salaf al-ṣāliḥ (“the righteous predecessors”). This title is applied to the first three generations of followers, al-ṣaḥābah (“the companions,” those who were alive during Muhammad’s life), al-tābiʿūn (“the followers,” those who were born after Muhammad’s death but were around while some of the ṣaḥābah were still alive), and tābiʿ al-tābiʿīn (“the followers of the followers,” those who were born after the ṣaḥābah had all died but who were around while some of the tābiʿūn were still alive). These generations are considered exceptional because of their proximity to Muhammad and to his direct companions, who could offer to the community the best examples in terms of living a pious life in the new faith. Salafis consider the wisdom and example of these three generations of the earliest followers of Muhammad to be the only proper model for behavior and society. They look to the Quran, the Hadith (reports of the statements or actions of Muhammad outside of his prophetic pronouncements), and the Sunnah (the habit or example of the Islamic community, as well as the “consensus” or ijmāʿ of the scholars of the community), but their interpretation of what constitutes “Sunnah” is limited to what can be known of the lives, examples, and scholarship of the three generations after Muhammad. Many in the West may be familiar with the term “Wahhabism,” a form of ultra-conservative Islam founded by an 18th century scholar named Muhammad ibn Abd al-Wahhab, which achieved political success/power via Ibn Abd al-Wahhab’s close ties to Muhammad ibn Saud, progenitor of the Saudi ruling house. It may be accurate to say that Wahhabism is a type of Salafism (though not militant Salafism), since both advocate a return to what they perceive to be the roots of Islam as a response to the challenges posed by modernity and the ascendance of the West, but Salafis as a rule reject the label “Wahhabi” for several reasons. For one thing, there’s the “all X are Y but not all Y are X” argument, meaning that the term “Wahhabi” represents one particular school of Islamic thought that is a product of 18th century Arabia, but Salafis derive their beliefs from other sources (Sayyid Qutb is one prominent Salafi thinker who had nothing to do with Wahhabism). Another issue with conflating the terms is that, outside (perhaps) of Saudi Arabia, “Wahhabi” can be slung around as kind of a pejorative by those who oppose Salafis, the implication being that Salafis are essentially foreign elements sent to destabilize society on behalf of the Saudi monarchy. Adding to the offense, “Al-Wahhab” (“The Giver” or “The Bestower”) is one of the Quranic 99 Names of God, so the label itself may be considered blasphemous. Another term often used is ahl al-sunnah, or “People of the Sunnah,” because they believe that their community is the repository of the true Sunnah, given their adherence to the earliest (and therefore most accurate, in this framing) examples of pious living, Muhammad and his earliest followers. In our modern era Salafism has come to be identified with al-Qaeda and affiliated groups (the Taliban, for example, who blew up the Bamiyan Buddhas according to the same precepts that encourage the other acts I’m talking about), who do theoretically represent an austere vision of what society should look like. But many Salafis reject the link and many Salafi scholars have explicitly rejected suicide bombing, and I am reluctant anyway to contribute to redefining al-Qaeda to mean “any Islamic groups we don’t like.” What is relevant for our purposes is that Salafism expressly condemns anything that can be defined as veneration of a religious figure, considering it to be an act of shirk, or polytheism (literally “associating,” as in associating something or someone with God). They consider such veneration to be among the many impermissible innovations, introduced since the days of the early followers, that have distorted the true Islam and weakened the Islamic community. Making pilgrimage to the shrines/tombs of important scholars and religious figures, which is a practice common among Sufis and Shi’ites, but not uncommon for Muslims in general, is absolutely forbidden under Salafi doctrines. Sufis are heretics by Salafi measures, traitors even, and their holy sites must be destroyed to protect the community from their pernicious influence. In countries whose governments have difficulty exerting authority or are sympathetic to the Salafi cause (as in Egypt, where the Muslim Brotherhood government has not been kind to the Sufi community), this results in the open and wanton destruction of shrines and the attempt to destroy the irreplaceable manuscripts housed in the Timbuktu library, which was fortunately thwarted by the residents of Timbuktu themselves. The same impulses, coupled with the allure of investment, are behind the ongoing, systematic demolition of historical sites in Mecca and Medina, sites that date to the earliest foundations of Islam. The Saudi monarchy is historically Wahhabi, and recall from above that Wahhabism and Salafism share many similarities. So the Saudi royals have little interest in preserving historical sites in the two holy cities aside from those things that are specifically part of the Hajj, such as the Kaaba and the Well of Zamzam. Developers, who want to take advantage of the massive crowds that visit these cities on the Hajj each year, would just as soon raze whatever they could to the ground in order to make room for hotels, restaurants, and other moneymaking ventures, and since the Saudi government sees no need to preserve these things (and no doubt wants to cash out as well), development proceeds virtually unfettered. The Saudi monarchy has in general had a horrific record in terms of preserving historical sites, but the problem only seems to be getting worse. It is important to bear in mind that these are small groups and groups within groups carrying out most of these attacks, and that in general the destruction of cultural heritage is not something Muslims support. 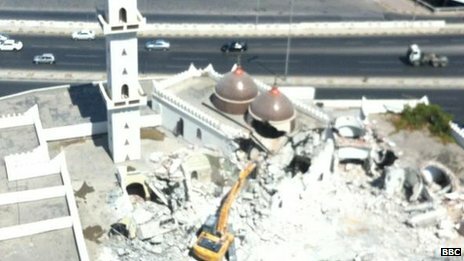 The Salafi groups that desecrate and demolish Sufi shrines, even if they have the overt or tacit approval of the government, are naturally unpopular among the people whose venerated religious shrines they are destroying. It was the people of Timbuktu, without any assistance from the Malian government and without the weapons needed to fight against the Salafis, who saved the Timbuktu library by safeguarding its manuscripts in their homes. The destruction of historic parts of Mecca and Medina is couched in terms of expansion that is needed to accommodate growing numbers of pilgrims, because the Saudis know that some excuse has to be fed to the Islamic public to mollify them. These are not popular movements, and they can be stopped if their support dries up. This entry was posted in Conflict, Middle East, North Africa and tagged Egypt, Islam, Libya, Mali, Mecca, Medina, Middle East, North Africa, Salafis, Saudi Arabia, Sufi shrines, Terrorists. Bookmark the permalink.